Hawa Hawai – The Queen who Ruled our Hearts! Harp – Book Review (BlogAdda) Baked eggs in Avocado Roasted Potatoes with Guacamole & Hummus The Man from U.N.C.L.E. Mahesh Lunch Home is the super famous seafood restaurant from Mumbai based in Fort Area and last year opened a branch in Dubai. We moved from Dubai but managed to visit it a couple of times. 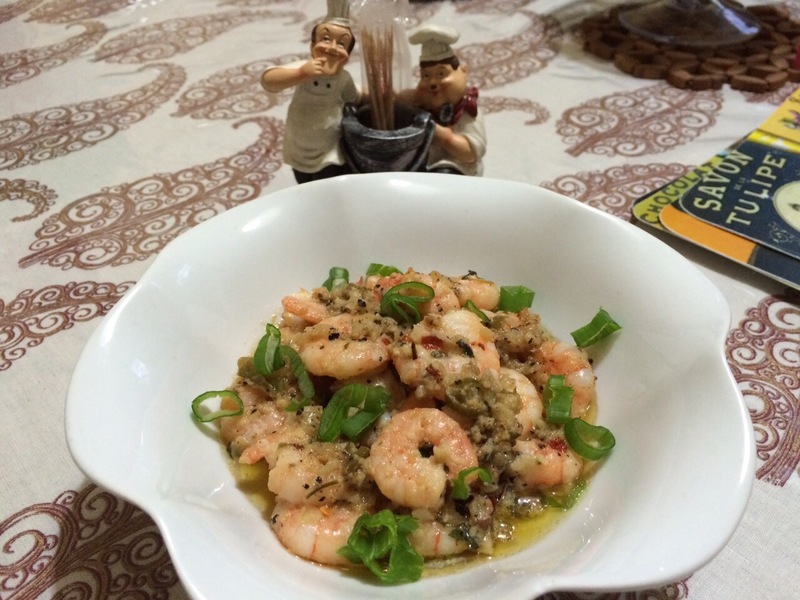 MDH loves their speciality Crab in Lemon & Butter Garlic sauce while I crave the Prawns with the same mix. 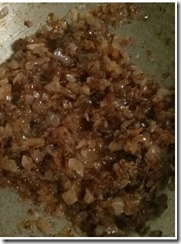 Fine chop half the garlic cloves and crush the remaining with a garlic crusher. Heat the butter in a pan, as it starts frothing add olive oil and then add the garlic. Sauté it till they turn slightly light brown, add the fine chopped green chillies , and salt and continue to sauté. After 5 minutes, add the prawns and mix well. Then add crushed pepper, at this point if you feel the butter is drying up you can add some more. Then add lemon juice and stir the mixture till you get your desired thickness. Sprinkle the spring onion greens on top and serve. The taste is amazing , try it and let me know how it turns out. The dish takes only 15-20 minutes of your time. Realised that the same place to a tourist and to a resident is probably equivalent to Dr.Jekyl & Hyde. Loved and hated my train travels – read more books this year during my daily commute than I did during any year in Dubai – this place makes you fall in love with reading! Learnt the art of balancing the book or the kindle in one hand and embracing the eerie silence in a crowded tube. Also developed a new found respect and love for my Mumbai’s local trains. My wish list for 2015 is to have one day of tube travel sans the signal failures, trespassers on tracks and fire alerts! Experienced 4 distinct seasons for the first time in my life – I would not trade anything in this world for London’s beautiful summer and spring! Did our best we could to travel around whilst we were settling into a new place – Manchester, Nottingham, Cardiff, Cotswold ,Burton on Water and Southampton! How much we had missed the clear blue skies and greenery during our time in Dubai – it is so soothing to drive on these roads and travel by train; I cannot even describe the blissful feeling. 4 stadiums visited – few local grounds and parks visited! What a place to watch cricket – all the stadiums need is my loud, non-stop , enthusiastic , exuberant Mumbai crowd to liven up the atmosphere. Tickets cost a bomb but the cricket viewing experience is just surreal – I wanted to chronicle it but I really struggled to blog and put up my thoughts owing to busy days at work & DIY household tasks! Our neighbours here! Oh we are so blessed on that aspect – our first neighbours in Dubai are now more dearer than our family and here we have pseudo parents! Our downstairs neighbours are the most adorable British couple I have met and they pamper us with love and food and thanks to my lovely 90year old neighbour I got to attend her lovely fun-filled English tea party on her 90th birthday we celebrated on our community lawns! Urrggghhh I hate how this place is expensive for nothing – movies and eating out – 2 things we absolutely love and were our weekly to-dos for last 5 years in Dubai. Here we watched 3 movies at a theatre last year – one is lack of time and two paying double the price we paid in Dubai! Yes, yes I will stop cribbing now ! Never thought I would hate the rains – London ensured I did! Does not even pour – just keeps drizzling and irritates the hell out of you! Wanted to whack the rain gods and tell them just pour your hearts out for once and leave! My lovely 4 year old niece kept us occupied throughout this year – she makes me laugh, her vocabulary at this age amazes me, I love her Brit accent and clear diction , we love to fight and we love to make up and the best part is she tries out all my dresses & shoes because wants to dress up just like her Mavshi! She is the apple of our eyes and she knows it! Her best friend is her uncle and when he is not with me she gets upset, because no one plays with her as well as her uncle does and the rest of us are of no use to keep her entertained! I love the drama queen she is – but she is growing up too fast and I’m beginning to miss my little munchkin! Managed a long visit to Mumbai and quick trip to Dubai – realised now I have two ‘maykas’ (mom’s house)! My Dubai friends and colleagues pampered me crazy when I was there and realised how much I missed not having them with me here, but I also felt nice that they missed me equally! I did miss not being able to visit Mumbai thrice a year – hope to make it atleast twice a year! I’m more busy at work and home and get very little time to be online or blog but like every year I will make the promise to do the best I can here on this space! So 2015 is here and hoping it is a great one for everyone – London though has the tough task on hand of getting me to love her 😉 Staying here is not easy, I keep cribbing but you already knew that is what she says to me! P.S: Got Sachin’s autobiography signed from the man himself – how could I not mention this! Samir was my favourite brother – 5 years elder to me, the protective sibling, and the one who would trouble me the most. My summer vacations were mostly spent in Pune and Ahmednagar and for most of these vacations he was my companion. His love for war movies rubbed onto me and he narrated many a stories he had read to me over our late night chats. He was fun-loving and full of life and he was one of the reasons my childhood was special. As we grew up and my vacations reduced , letters took over our lives. We wrote to each other every month – me going from school to college, experiencing crushes, anxiety over my studies, failing ,struggling and he going through his own battles. We continued to write and share our secrets cause my studies prevented me from long vacations and meeting up regularly. And then in May 2001, all those letters stopped. Despite being so close he never mentioned the losing battle he was fighting, my mom and aunts told me much later when his war was a lost cause; we were all helpless. I did not know how to react to the news, I did not know how to reach out to him and talk. I did not know what I could do to help. We last met at my cousin’s marriage and I have wonderful memories from the time we shared together. Joking, laughing, teasing, discussing our non-existent love lives, talking late into the night and re-living our childhood days. I promised to come and spend time with him once my final year exams were over. I could never keep that promise because Sam did not make it to the end of my final year. He finally gave up after fighting blood cancer. I did not get to see him in his last moments because I was writing my exams and my family did not tell me as they knew it would leave me disturbed. I was told 2 weeks later and all I felt was numbness all over. How was I supposed to react to my brother’s death? He was only 25! I don’t know how my aunt and uncle coped up with his loss, or how his elder sister and brother faced his demise – he the baby of the family and the life of the house and he was no more. We all knew his cancer was not curable, but despite knowing this fact we were never prepared, how do you prepare for your child’s death who has not even started to live his own life? I never cried out loud over his death and I have not had the courage to talk about him at length until today. All these years I have just grieved silently, all those unwritten letters piled up in a corner of my mind for the last 13 years – of stories and secrets that I never got to share with him. First I had lost my father when I was 17 and then few years later I lost Sam. They say you get over the death of your loved ones, you have to move on, yes you move on – 99% of the time. That 1% though will stay with you forever, till you breath your last. It is the truth no one dares to tell you – thinking that it will break you. But you are broken, and that is a fact. You will bandage your heart and mind and carry on; but the wounds will stay fresh deep, deep within your mind and heart. You will deal with most of the demons that surround the demise of your loved one but there will always be some that will haunt you for life. It made me very strong – emotionally – coping up with the loss of my favourite people; but it also left me vulnerable. I don’t show that aspect of my side ever and I don’t talk about it. But today here I’m – writing about it on my blog – for strangers to come and read; opening my heart out because the last week brought back those haunting memories that I thought I had buried for long. Cricket is my first love, cricket is my anti-depressant , cricket is my comfort zone, cricket is the one thing that never fails to bring me unfathomable joy – it has given me heartbreaks but it has made me smile a million times more. But the last week it shove the inevitable truth of life right into my face. My life has taught me enough about death – facing it, dealing with it, the emotional drain it causes, the strength you need to pick up the shattered pieces of your life and build it again. I did not need cricket to teach this to me all over again. Phil Hughes was doing what he loves most – playing cricket ; batting on the 22 yard pitch. Sport is supposed to be fun, it is not supposed to claim lives. Sport has its own dangers but death is not supposed to be one of them!. Phillip Hughes like my brother Sam was only 25. A life – a great sporting career lay ahead of him and it was cut short. I have struggled to accept he is no more. I did not know him, I have watched very little of him – but he played a sport I have so loved. A sport my papa taught me to love. So how did this beautiful game become the cause of Hughes death? I don’t know how will anyone console his parents or his sister, how will anyone console his team-mates, how will anyone console Sean Abbott and how will anyone console the fans of this game? I know they will get the strength from unknown quarters, gather up the pieces and move on. They will be strong and will face it but I hate to tell you that it will not be easy. I know it because I experience it everyday, every single moment of my life; years pass by and it is never easy! I have experienced many wonderful moments in my life and when I’m alone I can’t but help think – wonder what Papa would have said , wonder how he would have reacted? Maybe if Sam was around we would have laughed over some of them and he would have teased me! The What-Ifs – that is the 1% I’m talking about – that stays with you in every moment you experience without your loved ones. The picture, the moment always stays incomplete no matter how hard you try! And that will stay with all of us cricket fans for the rest of our lives now – the cricket that follows from now on will always be incomplete. RIP Phillip Hughes – you will live on in our memory forever. I’m terrible at maintaining this blog regularly – I realise it even more when I get down to pen a post and realise that I have not written about these loves on the blog before. Well better late than never right. As a kid the only superhero comics I read and watched were Superman, Spiderman and Batman – and even those were not read as extensively as some of my friends did. They know every dialogue written by heart! X-Men only caught my fascination once the movies were released. Since then the fandom for this set of superheroes has grown exponentially and I have to admit that the star cast has been a huge factor. Hugh Jackman, Ian McKellen, Patrick Stewart , Halle Berry and if those were not enough in the first 3 movies, they went and cast McAvoy, Fassbender, Hoult and Lawrence as the younger lot! And then they felt this too was not quite enough; so they got all of them together in the recent instalment and had Bryan Singer direct them. These were enough reasons to expect a cracker of a movie after the awesomeness that was witnessed in X-Men First Class. I must say this one did not disappoint; in fact it was way beyond my expectations; though I must add I did have one minor disappointment. The director did not give enough meat to Mystique’s role – yes she was the focus of the film but somehow I felt that Jennifer Lawrence did not get enough scope to prove her stellar acting prowess. She surely has oodles of talent to take Mystique’s character to the heights of popularity that the other characters in the series have achieved. As Charles, Eric and Tsark admit – she is special and unique and probably the most powerful of the lot. Also Jennifer Lawrence is a far superior actress to Rebecca Romijn who had essayed the role in the trilogy and I hope the next part does justice to her acting talents. Now before I go to the movie and the scenes that left me spell bound let me get this out of the way – there was Fassbender, McAvoy and Jackman on the screen together; that is criminal – I mean how are we ladies to focus on the movie and the story and the rest of the cast with so much hotness on the screen! Ok that’s the fangirl talking – ignore that and let’s stick to the movie. The movie is a brilliant example of how movie making techniques and the technology used have evolved over years to bring to life on screen the scenes that go beyond anyone’s wildest imagination. After watching the Magneto-Submarine scene in X-Men First Class I was convinced no other scene would come close to it and it probably topped my favourite movie scene list until I saw the QuickSilver Slow Motion Prison scene yesterday. A glimpse in the trailer below. Brilliant is a mild word for this scene. You have to be a whacky genius to first conceptualize it and then go ahead and execute it to perfection! I can assure you that The QuickSilver SlowMotion scene in the movie will blow your mind off. It is what they call cinematic genius and magic all combined into one. I can’t wait for the DVD/BluRay to hit the market soon so that I can watch it a million times and I know the more I watch it the more I will crave for it. It is intoxicating to mildly put it. The scene was shot to this lovely song (don’t forget to read the quicksilver related comments on the song; brilliance is oozing all over – ripple effect of the movie) and it has been stuck in my head since last night in a loop! Then there is Hugh Jackman , who is what he does best – Being Wolverine – Sarcastic, Angry, Impatient and now entrusted with dealing with a depressed , drowning in self-pithy and self-loathing Xavier portrayed by McAvoy (flawless again!) and getting him on track to ensure the future of the mutants is in safe hands. In the process befriending Beast, getting QuickSilver to help Magneto escape from the heavily guarded prison in Pentagon so that the duo Charles and Eric can find Raven(Mystique) and ensure the murder that changes the fate of the mutant community is averted. However the man who is the real star of the movie, the one who steals the limelight from an array of stars present in the movie has other plans. He does an U-turn on the team and goes about setting the future as he deems it should rightfully be. If Ian McKellen immortalized the Evil Magneto, to me Michael Fassbender takes the evil genius to a different level in this movie – an act that is going to be tough to beat. We saw glimpses of it in X-Men First Class but then there was the whole sympathy angle and him being good turning into evil bit. In this movie though , he is just a pure cold-hearted, unapologetic , unforgiving, conniving, evil genius that you love to hate. Magneto plays around with the weapons that were meant to destroy his clan like they were his toys. The railway tracks scene is the one where you sit on the edge of your seat wondering what is going to happen next . You don’t quite figure out the master stroke until the last scene of the movie where Magneto single-handedly holds the entire US government at ransom. The scene though where i almost fell of my chair was seeing him execute so much style and panache in a one minute scene where he walks into the Pentagon to retrieve his prized possession (the helmet)– Did you not notice the glasses, the hat , the suit and his uber cool poise? X-Men Days of the Future Past is a delightful entertainer for us X-men buffs but to me the enticing bit is with the future having been completely reset the movie makers can take some serious liberty to reignite the franchise and twist the stories around. The whole prospect is now making me delirious and 2 years seems like an eternity by when XMen – Apocalypse will hit the screens! Now waiting for the next instalment with bated breath – Damn you Bryan Singer! 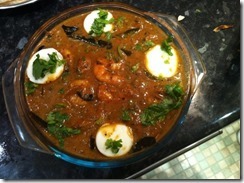 I get bored of making same old prawn curries that I know so I hunted on the internet to try something new. I found my love for south indian non-veg cuisine in Dubai and was quite craving the good old curries from Simran Appa Kadai and Calicut Paragon that we had so often when we lived there. I found this easy and quick recipe – and I made a little bit of my own variations. I added some more curry leaves, sautéed the onions till they were dark brown, a bit more pepper and bit more water to have more medium rather than thick gravy. The one on the link looks scrumptious too and next time will attempt to maintain the thickness and red chilly colour. Here is the one I landed up making based on the above recipe. I garnished it with coriander and boiled egg slices. Try it – I love curry leaves and pepper taste and South India has some lip-smacking, finger-licking meat and seafood recipes! We all have our favourite dishes – mine are any that have mutton and it really drives me mad when folks equate mutton and lamb. The one thing I’m missing after moving to London is not finding mutton in meat shops around. Guess I will have to venture out a bit far to find it here. 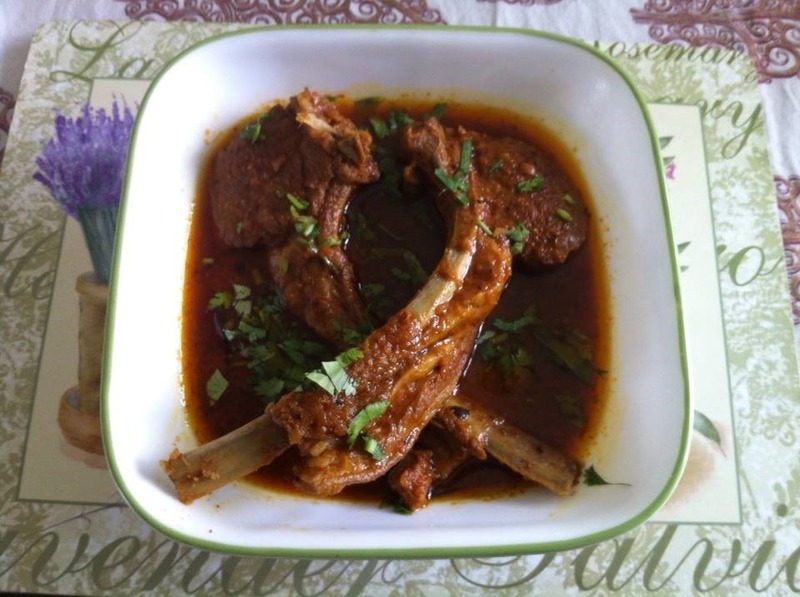 So to overcome my psychological barrier with respect to lamb, we finally got lamb chops from the butcher near our place and with some tips from my friends who are cooking experts at different cuisines and have cooked lamb often; I ventured out experimenting my mutton chop masala recipe with some variations. Mixed spices dry masala : Dry roast the following ingredients and then grind into a fine dry powder – 4-5 whole peppercorns, 4-5 cloves, 3-4 cms long cinnamon stick, 2 black cardamoms, 1 tablespoon fennel seeds, 1 tablespoon cumin seeds, 1 tablespoon coriander seeds, 1 star anise, 1 dry Kashmiri chilly. Marinate the lamb chops with the above ingredients. 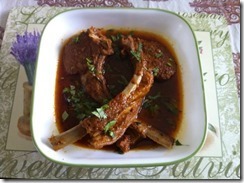 Since I was cooking lamb for first time I let it marinate for 24 hours. I made the gravy directly in a pressure cooker. 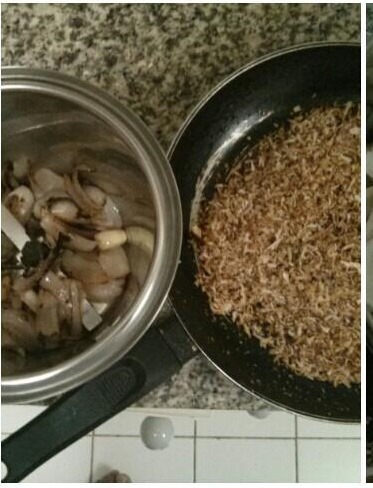 Add 3-4 tablespoons of oil , add 3 medium sized finely chopped onions and sauté on medium flame till they turn brown. Once the oil starts oozing out from the sides, add the marinated chops and mix well. Place a lid for few minutes and let it cook for 5-10 minutes. 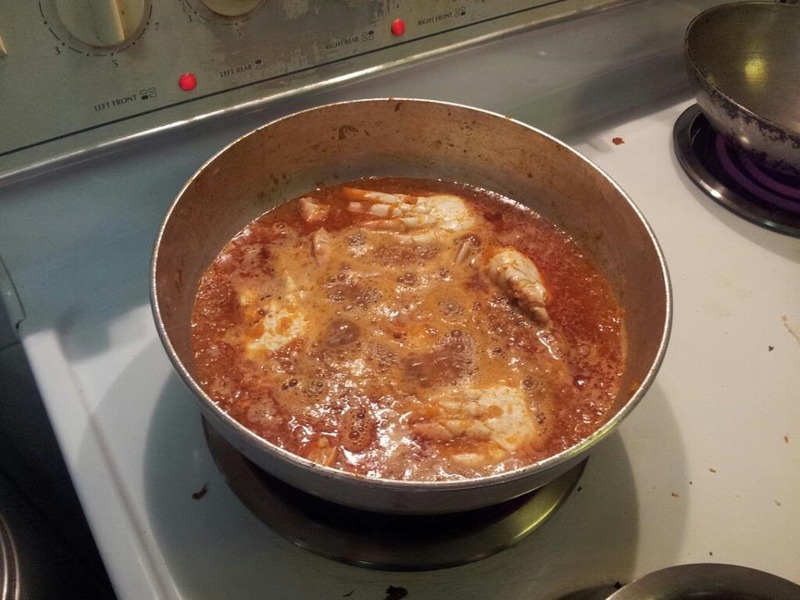 Then add 3-4 cups of boiling water such that it is enough to boil the chops in the pressure cooker. Shut the gas off after 3 whistles and let it simmer. Once the steam is gone, open the lid, and check if the meat has cooked well. If not, you may need to put the lid on for couple more whistles. When I attempted, the meat cooked perfectly with 3 whistles of the cooker. Garnish it with coriander and serve with hot parathas/rotis and rice. Every kid is biased towards his/hers mom’s cooking but in my family the bias is not just from my side as everyone agrees unanimously how awesome her dishes are; especially this one. She completely owns this recipe. I have not had this dish anywhere – neither at friends/cousins’ homes nor not seen it in hotels or restaurants that I have been too prepared in the manner that she does. Finally my home is set-up in London and most important part – the kitchen is now fully functional. Now with no luxuries of the cook – I have to think of a new dish everyday as more than MDH it is me who gets tired of eating the same dishes every other day. 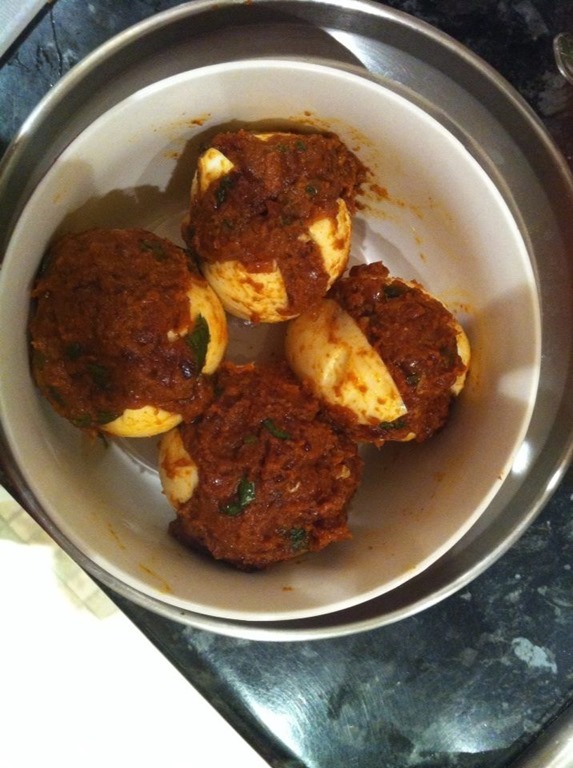 So here goes mumma’s famous stuffed egg masala that I managed to prepare last week. Kala (Black) Masala – 3-4 tablespoons. This is a Maharashtrian masala which is easily available in stores and mainly used for all non-veg curries. Coconut Paste: 2-3 tablespoons. ( This is the common paste we use in our non-veg curries and usal (pulse gravy) preparations). Boil the eggs and peel of the shell. Then slice 4 cuts evenly into the egg – keeping the base intact and the cuts good enough to insert the stuffing. Heat oil in a small wok (kadhai as we say) and add finely chopped onions. Once the onions are brown in colour, add turmeric, ginger-garlic paste , kala masala, salt and sauté for 5-10 minutes. Then add the coconut paste and little water so that it cooks well. Ensure the stuffing remains dry and not too watery else it will be difficult to fill it into the eggs. Add some coriander and mix well. 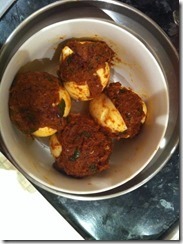 Let the mixture cool down, then with a small spoon fill each egg with the stuffing taking care that eggs do not break. Use very light pressure in the hands to fill this stuffing. Then ensure that the stuffing is smoothened out evenly on all sides and place these eggs back into the wok. Heat the wok, and turn the eggs on all sides delicately. I haven’t had an evening to myself since 10th of September. So much has happened in the last 4 months – I have not had a moment to sit down, relax, fall back, think, smile, laugh, get tensed, get worried, freak out, breathe in breathe out, assess, fret, get mad, get angry, shout out loud, scream , be happy , be sad, reflect – the last 4 months have flown by like they were 4 days, actually 4 hours, no forget probably 4 minutes. Jan 2013 – MDH and I kept wondering where life was heading and we both felt we needed a change – professionally or personally this year. This year. We had got comfortable and eased out in Dubai – our home for last 7 years and over the last year I was somehow getting the feeling that I was done with the place. We had to move out – either back home to India or to another land. We felt this was the year we had to make it happen; of course if life had decided otherwise and taken a different turn we would have thought of making the move few years later. You can’t predict what life holds for you but you can sure make an effort to turn it your way. And so we both tried, whoever got the first break the other would follow we decided. London – I fell in love with this city when I first came here as a tourist in 2007 and I came back twice later once on work and again on a holiday ; and every time I came back I realised how much I was fond of this place. I realized I would love working and staying here and when the opportunity came at work I took the chance, we took the risk and we moved here in Dec.
People ask us if leaving Dubai was an easy decision – it was in fact a no-brainer for me from a career perspective but not easy personally. All the right and wrong reasons will need another post. Don’t get me wrong – I liked the city, I will definitely miss my house a lot and more importantly I will miss my wonderful friends there who were my family away from India. At the back of our minds we always knew this place was going to be short term;by staying 7 years we had probably overshot our stay more than what we had planned to when we first came here. The last 4 months have flown by – relocation is not easy, I have no clue how people shift homes and countries every few years! Paperwork, paperwork and paperwork – it is endless. Exiting a country and entering a new country – we were lucky that my company was in charge of most things but settling into a new place is not easy however familiar you may think you are with it. After getting to London, everyday is a new learning and if anyone needs guidance on moving here just drop me a note! It is always mixed feelings when you leave and move on and when I find some time to breathe again I will do a post on my Dubai journey – what a rollercoaster ride it was for us. We left with wonderful memories of wonderful people – I’m not sure how much I will miss the place as years pass by but I will miss those wonderful folks and the relationships – will savour them for a lifetime. London – you will be a different experience altogether – if I did not love you so much I would have torn my hair apart by now thinking how difficult you have been to settle into for a newcomer coming into the country . Your warmth though has had the most calming effect on us (yes even though we have come in winter) – I’m amazed by your acceptance and ability to embrace. Stay this wonderful for as long as we decide to be here. A new life begins – still not settled in, but things are slowly falling in place. The tube travel, the DIY for almost everything, relying on yourself and no one else, the challenges at work, a whole new culture to embrace. We feel ready and it feels right. I haven’t been so excited and thrilled and tensed together in a long, long time. The shift has happened, now to soak it in! Grey’s Anatomy Season 10 has been pretty mediocre so far – not one episode has been gripping or held my attention for long. However last night when catching up on the last 3 episodes that we had missed out – two scenes from episode 5 stayed with me. I get Cristina – I always have. Many of you may not – but I do. She is my favourite character in the series. She often speaks out loud what most of us women don’t want to hear even though we know she is right; such as this scene when she reasons out with Meredith why she did not give her the surgery. But for first time while watching this series I loved Meredith’s response – and I get her too. Crabs are so dear to everyone in my family and I’m the odd one out to not eat them. 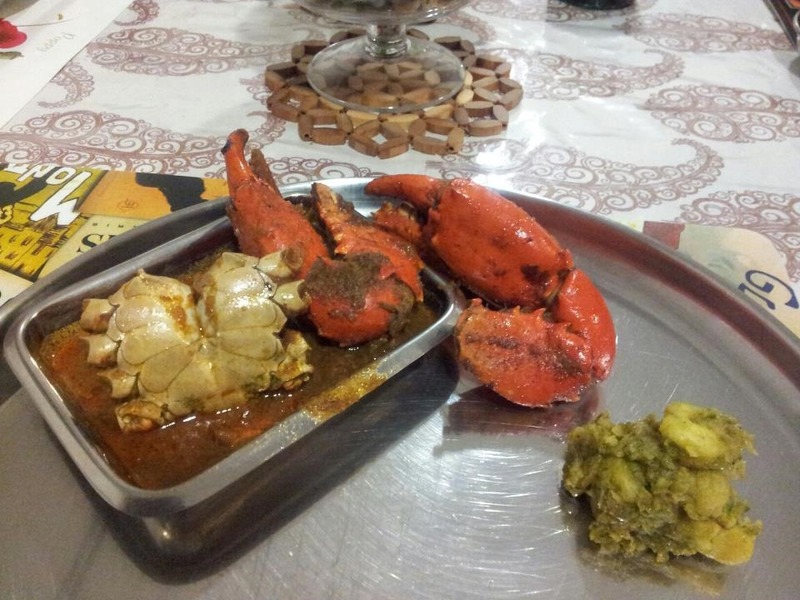 I have tried crab cakes or crab mince but not been able to develop a taste for the typical Malvani Crab Curry as my mother makes it. 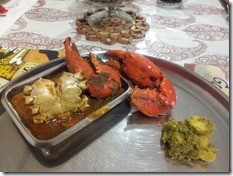 MDH is a foodie (you already know that by now if you have been reading this blog) and crabs are way way close to his heart (or rather stomach) . I wanted to learn how to cook this curry and after having done so I can proudly claim it turns out quite super – so here is the recipe for you all. 1 Kg crabs – cleaned and if large have them cut into halves to separate the claws and the main body. 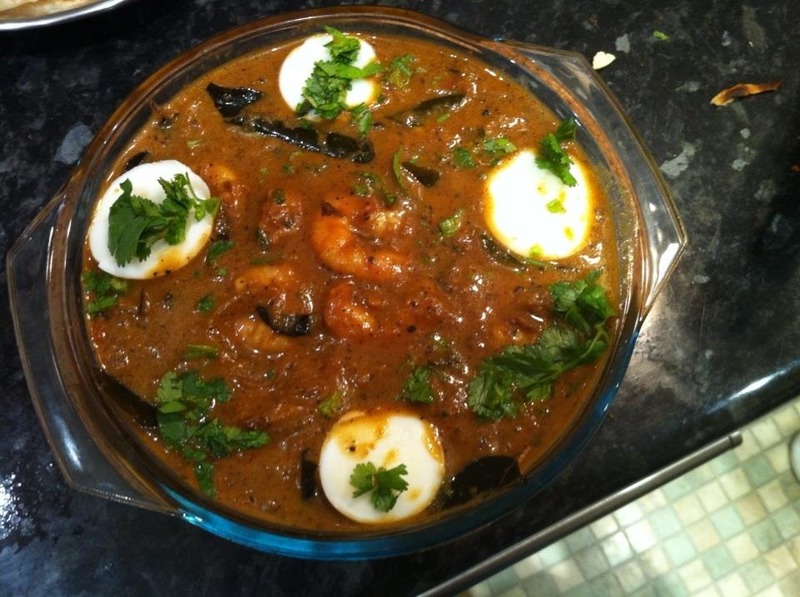 Kala Masala (Black masala) – 4-6 tablespoons depending on how spicy you want to make the curry. My recommendation the spicier the curry the better the taste. 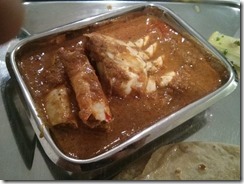 The Kala Masala is a Maharashtrian masala which is easily available in stores and mainly used for all non-veg curries. Clean the crabs well and apply little salt and set them aside. 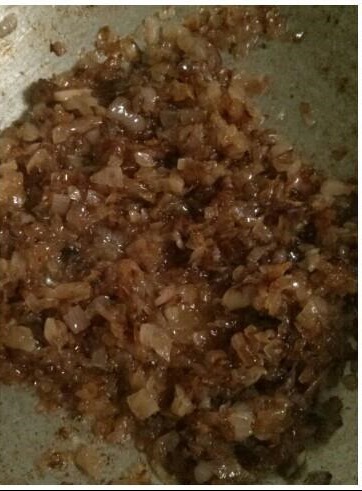 Heat oil in pan, about 3-4 tablespoons and add finely chopped onions to it. Sauté till the onions are dark brown and the oil begins to ooze out from the sides. Add ginger garlic paste and sauté for 4-5 minutes. Add turmeric powder and sauté for 2-3 minutes. Then add the Kala Masala powder in the given proportion and salt to taste. Add the crab pieces and mix well. Add 3-4 cups of boiling water and let the curry cook on medium flame. While the onions are turning dark brown and the crabs are getting cooked – prepare the coconut paste on the side as below. 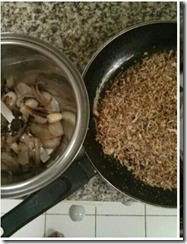 Roast dry grated coconut – 1 cup till medium brown in a pan and set aside. Then dry roast 1 chopped onion and 1-2 garlic petals in a pan. Roast till the mixture turns light brown. Then grind all 3 ingredients into a thick paste. The paste should be smooth and you should not be able to feel the coconut particles. You can make this paste in bulk and the same is used in chicken/mutton gravies as well as various pulses commonly made in Marathi households. 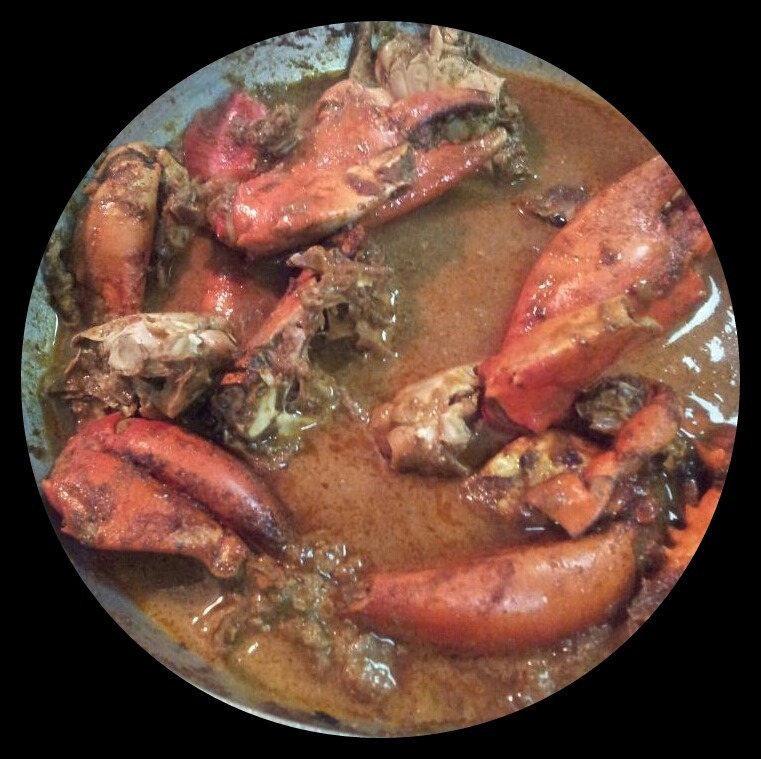 Once the crabs are 3/4th cooked in the curry add the coconut paste (3-4 tablespoons) and let the mixture cook on low flame. Keep stirring the mixture every 10 minutes. Add boiling water depending on how thick/thin curry you wish to have. We prefer thick curry. 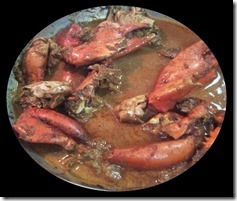 Crabs take time to cook and let the gravy cook for 20-30 minutes on low flame. Once the colour of the shells of the crab legs turns orange/reddish you know the crabs are done. 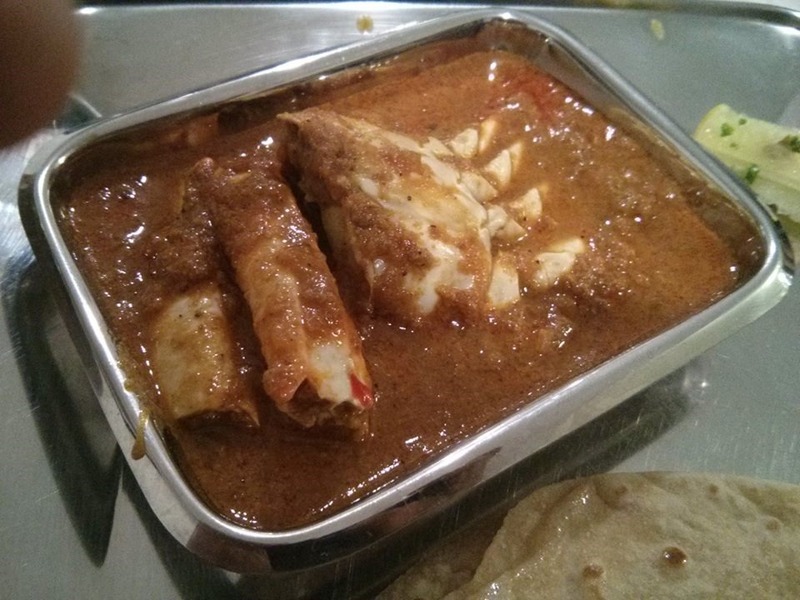 Enjoy your crab curry – try it out and let me know how it turned out. My own Pensive..come, fall in..